Yellow Vests (Gilet jaunes) protestors demonstrate in Strasbourg, France,on December 01, 2018. Roses/Press Association. All rights reserved. Many members of the movement in France and abroad have inquired about the position of DiEM25 on the “Gilets Jaunes” (yellow vests) movement, especially after the scenes of violence on the Champs Elysees which have been seen all over the world. We are not afraid to say it: we were divided about this many-faceted movement, which has evolved greatly in two weeks. What’s more, a large part of the French left shared our confusion. The first call to demonstrate in yellow vests, on November 17, started as a challenge to the new tax imposed on diesel by the state, allegedly to “finance the ecological transition.” We are not fooled by the total deception involved in this tax, created by a government which has abolished the wealth tax and which also imposes multiple anti-ecological measures, such as the opening of a gold mine in French Guyana despite the opposition of the local population. Bear in mind that ecological taxation is paid mostly by households, not by large polluting companies. However, at that time, most of us were not inclined to associate ourselves with an event strongly supported by the extreme right, sovereignist movements, and a good number of right-wing and liberal editorialists. While claiming to defend “La France du bas” (the downtrodden), the anti-tax slogan was not then accompanied by any demands on wages or on specific social measures. Moreover, favourable coverage by the media, while the movement was not mobilising more people – in fact rather less – than demonstrations against Macron’s labour law and ordinances, inclined us to mistrust this phenomenon, with its slogans against taxation, and therefore against public spending and redistribution. That said, the popular dimension of the movement, effectively carried by workers often strangled by austerity policies, has challenged us. Going beyond the anti-tax revolt, the protests reveal a France that is struggling to make ends meet. They have shown clearly that the taxes it pays do not prevent public services from deteriorating at a high speed: the public hospital system is in crisis, job cuts in education are announced, and rural areas are losing their public services. Moreover, the movement from the beginning has brought together a very great diversity of actors in its different contexts: the extreme right was very present in the South and the Parisian demonstrations, but in Saint Nazaire, for example, it has expressed trade union and progressive demands. In recent weeks, you have all witnessed the extension of the movement and its insurrectional dimension, with violence answered by police violence (to which we are accustomed in demonstrations in France). Initially marked especially sociologically by the lower middle class, who works but has trouble paying their bills, the movement has expanded to uberised workers and high school students. The anti-tax revolt has turned into a much wider movement of people who can’t take any more, and the list of their demands is varied and growing. Many of them deal with justice and equality: tax justice, increase of the minimum wage, more progressive income tax, the end of austerity, maximum salary at 15,000 euros, an end to the closure of public services. Others are much more problematic for a progressive movement, such as the deportation of rejected asylum seekers and increase of the budgets of the police and the army, or completely random demands. It should be noted that since the movement is decentralised and its leaders are self-proclaimed and contested, these lists vary according to the sources. It is amusing to note, moreover, that since the movement has started to present social and political demands, and its violent elements are attacking luxury boutiques, the language of the right-wing editorialists who supported it has changed a lot. What are the political opportunities? 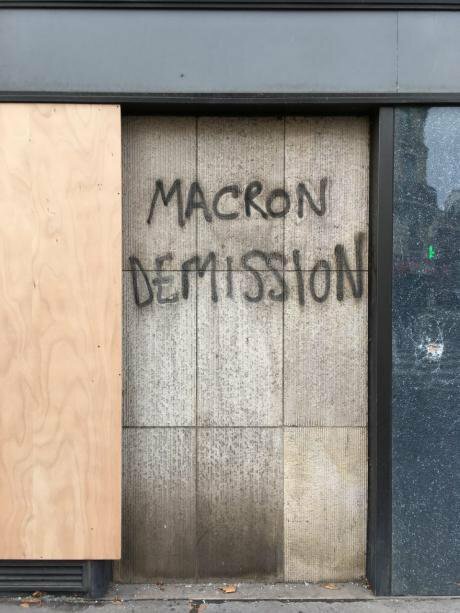 For the moment, a key direction and a key watchword unites this disparate movement: the rejection of the Macron government. The yellow vests call for his resignation as well as the dissolution of the National Assembly. Foremost is a rejection of his policies, and also of the personality of Macron himself, rightly perceived as emblematic of class contempt. It must be said that he and his government have used outrageously provocative language against “people who are nothing”, or the “unemployed who just have to cross the street” to find a job. Gilets jaunes grafitti. Emma Justum-Foundethakis. All rights reserved.This hate is coupled with a massive rejection of political movements. The extreme right and the sovereignty movement “Debout la France” of Dupont Aignan are very anxious to co-opt the movement. Recent demonstrations appeared to mark a tipping point, with far-right figures thrown out of the demonstrations. But several of the self-proclaimed leaders come from the National Rally of Marine Le Pen, or advocate solutions related to fascism, like a provisional government led by a general related to the far-right. The movement today is national, and in part nationalistic. It would be very difficult to talk to them about the reform of Europe. Nevertheless, it is a challenge to our movement, not only on the demands for social justice and taxation that we share, but also on the issues of territorial inequality that should also be one of the pillars of our programme and concern all of Europe and beyond: the same issue – bitter opposition to London from the de-industrialised North – was important in the Brexit referendum result, and resonated during the election of Trump. These protests driven by inequality take a different and unique form in each country, but we believe that DiEM25 must work on a European scale, drawing on a range of commitments in the founding pillars and axes of the European Spring: to socially just public services, an ecological transition, and the reduction of educational and cultural inequalities. We must counter a reactionary discourse, often tinged with racism, which opposes “Peripheral France (supposedly white)” to “city-dwellers” and “suburbs”, multicultural “for whom we have done too much”. And reaffirm that our solidarity does not stop at borders. This movement is also an opportunity to deepen our discourse on the ecological transition that must not be done at the expense of the popular classes. France is the European champion of urban sprawl and the establishment of shopping centres on its urban outskirts. For decades, politicians and advertisers have incited the French to own their own house, and now they are strangled by mortgages and dependent on the car for mobility. When talking about transition, we must not forget territorial planning and mobility. On December 8, there will be in France, like everywhere else, a climate march with which DiEM25 is associated. There have been calls for the Yellow Vests to join. This may be an opportunity to start a discussion. Meanwhile, the movement has opened up a wide debate in France. 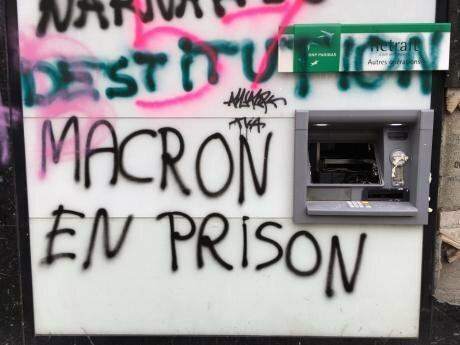 We do not endorse the excesses, we condemn the attempts at co-optation, but we cannot ignore it, nor especially ignore the social anger it reveals against Macron’s Thatcheresque regime of austerity. On the eve of the fourth day of action of the Yellow Vests, the tone is one of heightened drama. The government has chosen to send armoured vehicles into the streets with 89,000 police officers, including 8,000 in Paris, and is adopting a highly alarmist tone about the risk of violence in its attempt to deter demonstrations. Police officers talk about live ammunition being fired in violent incidents. As the highschool protest movement grows, brazen police violence against highschool students is causing widespread outrage on the left and a scandalous video going viral on social networks has caused embarrassment to the government. President Macron has said he would speak early next week. Discussions with the Prime Minister with the Yellow Vests in Matignon ended precipitately and showed the division of the movement. Calls for calm do not seem to undermine the determination of a section of the movement’s base that does not want to negotiate. All the eyes of government, now out of answers, are turned towards tomorrow's event, which could have radical consequences. The unions remain cautious. In a statement signed by seven of them, they urge the government to negotiate on purchasing power, wages, housing, transport and public services, but condemn violence. 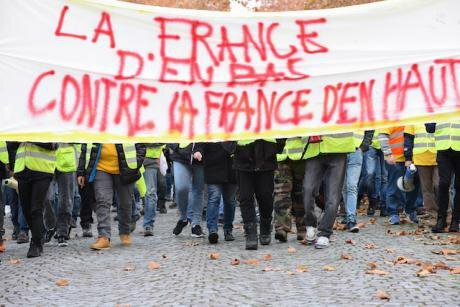 The CGT states that it cannot envisage full convergence with the Yellow Vests due to the presence of the far right but strongly condemns police violence and calls for a day of strikes on 14 December. At the initiative of Attac and the Copernicus Foundation, a call for political personalities, trade unions, associations, academics and artists, with which DiEM 25 has joined forces, invites them to attend the climate demonstration in conjunction with the yellow vests’ action day. Yesterday, at the meeting of Benoît Hamon of Génération.s, a movement allied to DiEM 25 as part of the European Spring and addressed by Yanis Varoufakis, as well as Jacques Terrenoire for DiEM 25 France, several speakers including James Galbraith stressed that yellow vests were the children of austerity policies and protested against the contempt shown the movement. Yanis Varoufakis and Benoît Hamon stressed the government's responsibility to call for an ecological and social New Deal to transform the situation from the top of the system, at the European level.